Dr. Weiss is a graduate of the University of Texas Medical School at San Antonio. He completed his otolaryngology residency at the University of Texas Medical Branch (UTMB) in Galveston. He then completed a 2-year Head and Neck Fellowship, training under Dr. Byron Bailey. Following this, Dr. Weiss joined the faculty at UTMB, and then went on to serve as the Chief of Otolaryngology at Keesler Air Force Base. Dr. Weiss is board-certified by the American Board of Otolaryngology, is a Fellow of the American Academy of Otolaryngology – Head and Neck Surgery, and is a member of the American Rhinology Society. Upon entering private practice in 1995, Dr. Weiss was involved in the development of the Cedar Lake Surgery Center in Biloxi, MS, where he is now one of the primary managing partners. The primary focus of his practice is to reach and help patients suffering from sinus and nasal problems. His clinical research interests include minimally-invasive endoscopic sinus surgery, advanced image guidance sinus surgery, and nuances of sinus outflow tracts. He has been intrigued with the potential of improved outcomes utilizing computer algorithms, as well as how advanced digital capture and display can expand patient and physician education. He has lectured extensively, both nationally and internationally. Dr. Weiss was intimately involved in the CLEAR study – the initial clinical study evaluating Balloon Sinuplasty, and has completed several hundred ESS cases utilizing Balloon Sinuplasty devices. 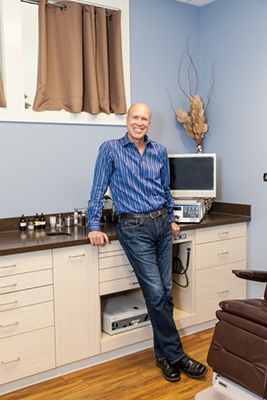 In 2005, he founded the original Sinuplasty Center of Excellence, and remains the medical director. He performed the first satellite telecast of a live Sinuplasty sinus surgery case in the fall of 2006. In July 2007, Drs. Weiss, Howard Levine, and Peter Catalano held the inaugural Sinus Forum, an annual innovative open-forum based platform for the discovery of minimally invasive alternatives within sinus surgery. Entering into its fifth year, this meeting has become the fastest growing meeting of its kind within the ENT space, and has also expanded to include an annual international meeting. In 2010, Drs. Weiss, Levine, Catalano and Bill Bolger co-founded the Foundation for Innovation, Education, and Research in Otorhinolaryngology (FIERO). This not-for-profit foundation was established to promote creative innovation, facilitate the exchange of knowledge, stimulate discovery, and ultimately, enhance medical and surgical treatment of the ear, nose, and throat. FIERO plans to utilize its endowment in three areas: to support educational meetings such as Sinus Forum and Sinus Forum Asia, to support research by establishing a core lab to evaluate new technologies and new treatments independently and expeditiously, and to develop educational materials for physicians and patients in electronic and print format, including a new medical journal focused on innovation in Otorhinolaryngology. For appointments call (228) 357-9681 today! To learn more about me, check out http://about.me/rayweiss.